Chris started scouting as a Tiger Cub and completed Webelos at Pack 1714 , during which time he earned the Arrow of Light. He continued his scouting career with Troop 75 and achieved the rank of Eagle Scout. In the scout troop, he held the positions of Patrol Leader and went to Philmont. He also attended Summer camp each year. He hiked portions of the AT several times on the troop 50-miler. He was elected into Order of the Arrow, and was on their performing team till he left scouting. During that time, he served as the Chapter Chief. He graduated from Pope High School in ‘96 and went into the Army. He was in Basic at Fort Benning and then was assigned to the 101st Airborne Division. From there he did a tour in Germany. Once home from there he was stationed at Fort Campbell, KY. Then he was deployed to Iraq. He did leave the Army for a short while in 2004, but then re-enlisted and was stationed at Fort Hood, TX with the 1st Battalion, 12th Infantry Regiment, Fourth Brigade, Fourth Infantry Division and was attached to the Fort Campbell, KY unit. 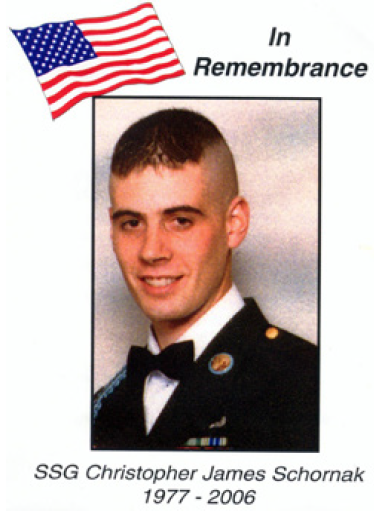 In Dec ‘05 was deployed a 2nd time to Iraq and was killed by enemy fire on Feb. 26, ‘06 while on patrol. During the engagement, he was able to protect his squad. He was the recipient of numerous commendations, including the Bronze Star with combat, distinguishing device, Purple Heart, Meritorious Service Medal, Iraq Campaign Medal and Combat Infantry Badge. He is survived by his wife Robyn, his son Tristan, his sister Susan, his parents, Jim and Lesley, and his grandmother, Barbara Smith. Application due by April 15th, 2019! 3324 Canton Rd, Marietta, GA 30066. Checks should be made out to the Chris Schornak Eagle Scout Memorial Scholarship Fund.